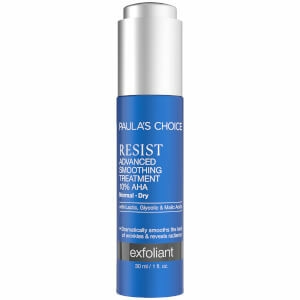 Resist Daily Smoothing Treatment with 5% Alpha Hydroxy Acid is a must-have exfoliant for those who want their skin to look and act younger. This product features an effective concentration of Glycolic Acid with a boost of pore-penetrating Salicylic Acid. This anti-aging exfoliant reveals youthfully radiant skin and counteracts sun damage without redness or irritation. Renews skin's texture and evens tone. Smoothes fine lines and stimulates collagen production. Apply daily after cleansing and toning. 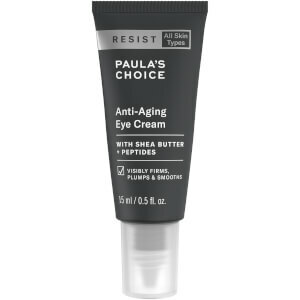 Dispense 1–2 pumps and smooth over entire face. 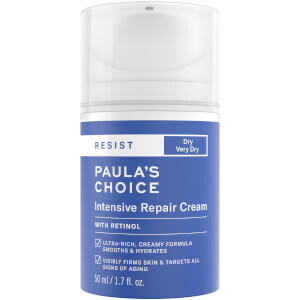 Follow with Paula's Choice Resist Super Antioxidant Concentrate Serum or Resist Barrier Repair Moisturizer. First-time users should apply once daily, preferably at night. Avoid direct contact with eyes. Water, Glycolic Acid, Cetyl Alcohol, Butylene Glycol, Palmitoyl Oligopeptide, Ceramide 2, Tetrahydrodiferuloylmethane, Tetrahydrodemethoxydiferuloylmethane, Tetrahydrobisdemethoxydiferuoylmethane, Epigallocatechin Gallate, Caffeic Acid, Salicylic Acid, Disodium Lauriminodipropionate Tocopheryl Phosphates, PEG-10 Rapeseed Sterol, Cucumis Melo (Melon) Fruit Extract, Bisabolol, Allantoin, Dimethicone, Cyclopentasiloxane, Cyclohexasiloxane, Dimethiconol, Tribehenin, Polysorbate 20, C12-15 Alkyl Benzoate, PPG-14 Butyl Ether, PEG-40 Stearate, Sorbitan Stearate, PVM/MA Decadiene Crosspolymer, Polyacrylamide, Disodium EDTA, C13-14 Isoparaffin, Laureth-7, Sodium Hydroxide, Caprylyl Glycol, Ethylhexylglycerin, Hexylene Glycol, Phenoxyethanol.